Welcome to the Chrysler Sebring obscure facts page. This page is dedicated toward keeping track of the obscure facts related to the 1995, 1996, 1997 and 1998 Chrysler Sebring. In this page, we are concerned with the coupe, not the convertible model which has a separate web site. The Coupe and convertible are actually quite different cars, although they do share some parts. All Chrysler Sebring Coupes are built in an assembly plant located in Normal, Illinois. This assembly plant was once a joint venture between Mitsubishi Motors and Chrysler Corporation, but a few years ago, Mitsubishi purchased the remaining interest in the plant from Chrysler. So Chrysler Sebrings are technically known as transplants, since they are now assembled under Mitsubishi management. The other cars produced in this plant are sold under a variety of names. Obviously, the similar Dodge Avenger is also assembled in this plant. The other cars assembled in this plant now include the Mitsubishi Galant, and the Mitsubishi Eclipse and Eagle Talon. The Sebring coupe owes a lot of its underpinnings to the Mitsubishi Galant and to the Eclipse and Talon. Basically, the Sebring coupe is an Eclipse with wheelbase stretched to 103 inches. This makes for a much larger back seat than the Eclipse/Talon have, with more leg room, and, in particular head room in the back seat. The dash is basically shared with the Eclipse/Talon. The engine options differ in that the high performance 4 cyl. available on the Eclipse/Talon is not available on the Sebring, but, instead, a 2.5 liter V6 is available. The optional V6 (Standard on the Lxi) is built by Mitsubishi, and was originally used by Chrysler as the V6 option in their mini-vans. The 4 Cylinder is manufactured by Chrysler, and is basically the same engine used in the Neon, with some effort devoted to reducing noise. Interestingly, most of the road tests in the major car magazines indicate that the 4 cylinder accelerates a bit faster than the V6, but the V6 has an edge in smoothness. Sebrings differ from Avengers in a few small ways in addition to the cosmetic differences. For example, the spring rates in the Sebring are more nearly tuned to a smooth ride, whereas the Avenger is set up for a slightly stiffer ride. The Sebring convertible is built in Hermosillo, Mexico,in a plant supervised by Chrysler, and is not very much related to the coupe. It's underpinnings bear a closer relationship to the Chrysler JA cars--the so called "cloud" cars (Stratus, Cirrus and, now, the Plymouth Breeze). There were only a few changes in the Sebring for the model year 1996. The 1995 model year was short, since the car was introduced in April of 1995. The reason it had the 1995 model designation is that the Avenger had been introduced the previous fall, so dealers could not be selling 1995 Avengers alongside 1996 Sebrings. Legally, however, all Sebrings could have been called 1996 models. Horsepower of the V6 was increased from 155 to 163 hp. There are no externally visible changes in the engines between the 1995 and 1996 models, and Chrysler has been reluctant to reveal where the horsepower boost came from. Either the same engine was simply re-rated (that can happen) or perhaps there was perhaps some changes in the electronics that control fuel management. This is a great mystery, and if someone from Chrysler would like to explain this, I would appreciate the information. The universal garage door opener is now built into the sun visor, and standard on the LXi model. There were several color changes. Basically 1995 Char Gold Pearl Coat was replaced with Spanish Olive Pearl Coat and Medium Blue Metallic was replaced with Light Autumnwood Pearl Coat. Careful scrutiny reveals, however that the dark green has also changed in hue slightly between 1995 and 1996, in 1995 it was known as Deep Green Metallic, but in 1996 is known as Polo Green Pearl Coat. The Pearl Coat designation is of interest, in that it indicates a color that "travels"--the technical term for a metallic paint that changes color depending on lighting conditions. All of the Sebring colors except Bright White, Black and Medium Gray are pearl coats for 1996, suggesting that all of the remaining colors "travel" to a certain degree. The Silver Mist Pearl Coat illustrates the phenomenon, and under some conditions, looks pure silver, but on other lighting conditions, has a blue tinge, while under still other color conditions, appears gold. This is an extremely attractive paint color. Tom Binney, a Sebring owner (see owners' page) supplied the following information on the Sebring Pearl Coats.
" My '95's color "travels" and I actually thought I had purchased a dark teal when I picked it up. Then next morning in a slight fog you would have thought it was a blackish green and in full sunlight it changes depending on the angle you're at from blue-green to almost British Racing Green. This is due to the metallic pigment. The Pearl effect is due to the use of Mearl Corporation's pigments in the newer cars. This is a product that tends to give a red/blue, red/green or other specific combination "Iridescent" effect to the paint similar to the "mother of pearl" effect. I've been in the paint related industry for 30 years and some of these special effects have been around for 20 years or so and are just starting to get into the commercial auto market. Wait until they start to use "Flip Flop" overcoat colors - you won't know what color to expect when you go back to the parking lot to get your car! They can create drastic color changes due to type of light and angle of reflection!" The V6 engine illustrated on pg 8 of the 1995 brochure is different from the one actually used in the car in that there is no container with a yellow cap and other differences. The V6 engine used in the 1995 and 1996 models is correctly illustrated on pg. 10 of the 1996 brochure. The photo on page 15 illustrating the cargo net in the 1995 brochure shows a Dodge Avenger, not a Sebring! This photo has been corrected on pg.13 of the 1996 brochure. Study carefully the Dark Green Metallic Sebring on pp. 20-21 of the 1995 brochure and compare that with the similar illustration of the Polo Green Pearl Coat illustrated on pp. 18-19 of the 1996 brochure, The illustrations are obviously the same photo, but magically the Polo Green has been lightened in the 1996 brochure. This was probably done with the aid of a computer. Note the subtle interior changes between the 1995 and the 1996 brochures on pages 10 and 11 of the 1995 brochure versus the illustration on pp 8 and 9 of the 1996 brochure. The most obvious difference is that the 1995 car shows perforations in the leather, whereas the 1996 does not. My Sebring has a cloth interior, but, as I recall, the 1995 Sebrings I looked at did not have the perforations. I would be interested in hearing from 1995 Sebring owners, especially if there are some who have the leather interior with the perforations as illustrated in the 1995 brochure. Note also that the stereo dial has changed. This is probably correct in that the 1996 brochure illustrates the modifications made in the upgraded Infinity stereo. The shininess of the leather in the 1995 brochure appears to have been toned down in the 1996 illustration. There are other subtle changes in the dash button colors. All of this appears to have been done by retouching the original photo via computer. A separate sales brochure is mailed out on request by dialing 1-800-4AChrysler. The 1995 version contained photos of the dark green model. A photo in this brochure shows a black ash tray cover (the one used in the Avenger) in the wood grained Sebring console. I have not seen this brochure for 1996, or determined if this error has been corrected. Road tests of the Sebring coupe appear in the following magazines. Also, Automobile Magazine's Great drives (pd for by Chrysler featured the Sebring in the article on pp.20-31. Print ads in the inside covers of the April 1995 issue of Automobile magazine, the April, 1995 issue of Motor Trend, and the April, 1995 issue of Car and Driver all feature a Silver Mist Sebring. Silver Mist Sebrings have also been appearing in more recent print ads, and a new TV commercial. I was in New Orleans, Louisiana in early February, 1995, several weeks before the Sebring had been announced. Six Chrysler Sebrings drove up to the underground parking area of the hotel. All of them were in Deep green metallic, and, interestingly, all bore Louisiana manufacturer license plates. Why Louisiana was a great mystery. Apparently, the Sebrings were in New Orleans for a pre-show for the dealers. The cars were clearly labeled as Sebrings, and looked identical to the model that was introduced several weeks later, with one exception One individual looking at the Sebrings said he didn't like the texture of the grille. Interestingly, the "grille" was not like the one that was introduced with the horizontal bands, but rather had a "honeycomb" appearance. Apparently, the grille texture was a "last minute" pre-production change, based on dealer comments.If anyone from Chrysler is willing to reveal what was going on here, I would appreciate hearing from them. "For 1997, the Sebring gets revised front and rear styling and body side cladding. The LXi adds 17 inch wheels and tires and a handling package with a rear anti-roll bar." The "non" grille has been the subject of debate in the auto magazines since the 1995 first came out. Personally, I thought it was neat, but some reviewers thought that it cheapened the appearance of an otherwise expensive looking car. It's been changed for 1997. My brother has long complained that the sides of the car were overloaded with cladding. I pointed out its functional utility in preventing parking lot dings and scratches, but to no avail. Apparently, this has been modified somewhat for 1997, but the cladding has not been eliminated. Revising plastic cladding, front and rear fascia is far less expensive than redoing body metal. I was able to locate a sales brochure at my dealer's, It is not a large book as was available in 1995 and 1996, but rather a 1 page foldout, apparently designed for mailing. Whether a larger sales brochure is out yet, I do not know, but I have not seen one. The changes for 1997 are quite varied, some good, some,...well, let's see how they wear on me. The biggest news is the revised front and rear fascia. In fact, all of the plastic pieces below the belt line are changed somewhat. By far, the most controversial aspect of the new design is the new "grille." Larger and more prow shaped, the black area appears to have pleats similar to the 1995-1996 design. The grille is now integral with the lower fascia, instead of two separate pieces as in the 1995-96 design. The Chrysler 300 "cross hairs" design is gone. In its replacement is a Chrysler blue- ribbon logo with chrome wings that evoke Chrysler grille trim designs of the 30s and 40s. In fact, in looking over photos of the 1934 Chrysler Airflow and other Chryslers built prior to World War II, the new grille evokes images of a similar art deco design. Nouveau retro is in. I'm certain this wing design was used on Chryslers of that period, but if there is someone out there who can tell me exactly when and on what model it was first used, I would appreciate hearing from you. Both the grille and the winged emblem remain controversial, in my view. Air intake remains below the grill, but its shape has changed. Fog and parking lights appear similar to the 1995-96 design.Here is a photo of the new front end design. Moving around the side of the car, the most apparent change is in the cladding, which now features a pair of raised ridges that extend the length of the car. These ridges start on the side of the front bumper cladding, go across the doors and to the side rear cladding behind the rear wheels. This cladding design will be controversial. Whether or not it looks "better" than the older, cleaner, design is a matter of opinion. The new standard wheels for the LXi appear to be a ten-spoke design, quite different from the 1995-96 version. They are now 17 inches in diameter, riding on a P215/50 HR17 tire, a change from the P205/55 HR16 used in 1995 and 1996. The rear of the car has changed too. A curved convex panel where the license plate was now contains the Blue Ribbon Chrysler logo and Sebring label (Gold on the LXi). The rear bumper has changed too with the twin ridges extending around the rear of the car, and the bumper now accommodating the license plate. A new spoiler similar to the one used on the Dodge Avenger is standard on the LXi. Despite the lack of sheet metal changes, the exterior is different from the 1995-96, and my first reaction is that it looks somewhat more cluttered that the previous design, but, them, I haven't seen one in the flesh yet. Overall length is up to 191.1 inches, from 187.4 inches, probably because of the new prow-shaped grille. This is getting to be a big car! Curb weight is up 15 pounds on the LX (to 2,959) and 40 pounds (to 3,197) on the LXi. Overall width is down from 69.7 inches to 69.4 inches. There have been many changes here. Returning are Black and White Clear Coats, Wildberry Pearl Coat, Polo Green Pearl Coat and the ubiquitous Silver Mist Pearl Coat. New this year are Indy Red (a non-Pearl Coat-- brighter red than has been used on the 1995-96 Avenger), Paprika Pearl Coat, a bright orangish-rust metallic, and Pewter Blue metallic, a color that appears to travel to Iris overtones. Gone are Light Autumnwood, Medium Gray Metallic and Spanish Olive Pearl Coats. Generally, colors that last for only one year didn't sell well that year, while top-selling colors continue. The most important change is the total elimination of the two-tone cladding that was mandatory on some colors in previous years, but not used on others. These two-tone colors worked better on some colors (such as the Mercedes-like white and silver) than on others. The new grille design integral with the lower front fascia probably would have looked dumb in a two-tone scheme.The LXi features gold exterior badging, which I presume means that the lettering on the rear is in gold on the LXi, but chrome on the base LX. This is a biggy which I'm sure none of you will want to miss. The fake wood grain now extends all the way up the dash to cover the plastic piece that encloses the heater/AC controls. Not only that, the ashtray cover is wood grain instead of black. Let me rush to my dealer for a wood-grained replacement! In addition, there is a new two-tone black and tan interior color combination. Basically, the portion of the dash at glove box level is tan, but the remainder of the dash is black. The tan trim also extends upward to the arm rests on the door panels. The interior is now available in a butter tan color to match the dash and door treatment with carpet of the same color. This tan color is quite different from the brownstone available in previous years. The gray interior apparently remains all gray, with no two-toning. Engine and transmission options remain unchanged. There is apparently a new door beam system called Dynamic Side Impact protection. The standard LX radio and cassette system now has six speakers instead of four. The LXi standard system includes 6 speakers, a 3-band equalizer and a combination cassette and CD unit. An automatic electrochromatic day-night mirror is standard on the LXi. The standard LX wheel covers have been changed from 1996. THe changes, while interesting, are not quite to the point where I want to rush down to my dealer to trade in my '95 model. I would appreciate hearing from those of you who acquire the first '97s If you discover other changes in Sebring coupes between 1996 and 1997, no matter how obscure, let me know. I have received very little information from owners about problems with the car. The potentially most serious problem is a malfunction in a brake light sensor that has the effect of apparently keeping the brakes ever so slightly engaged when the car is going down the road. This is resulting in premature shoe wear. There is a Chrysler service bulletin out on this. The battery in mine said goodby last weekend after 4,300 miles of ownership. The battery is no-name, but has a Magic Eye on it! The type number is 86. It's a weird size. Bottom line: I'm running ok on an ill-fitting temporary CarQuest battery, and the dealer has one on order, but it hasn't arrived yet. [Update: the battery has been replaced at the dealers:two bad cells, and no other problems] Another owner wrote of problems with the coil. Interestingly the J.D. Power initial quality survey showed a high defect rate, over 200 per car in the first six months of ownership, but the Consumer Reports data look quite good, well above average. 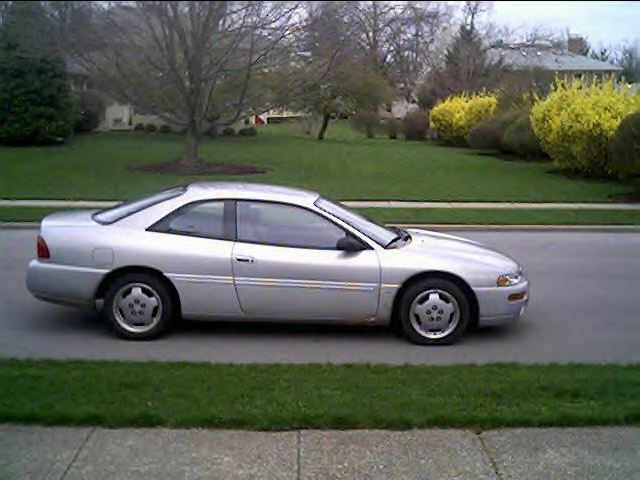 My Sebring is a 1995 LXi model, in solid silver mist. It has the gray cloth interior, and the standard set of LXi features. Here is a photo of my Sebring. Comments about Chrysler Sebrings should be sent to me, David Debertin.